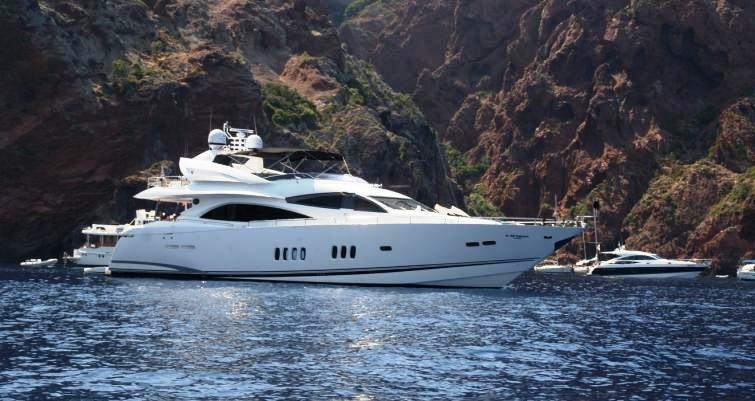 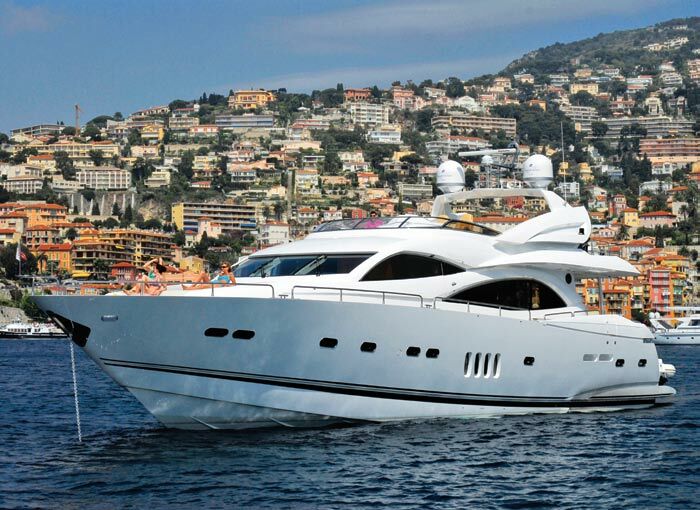 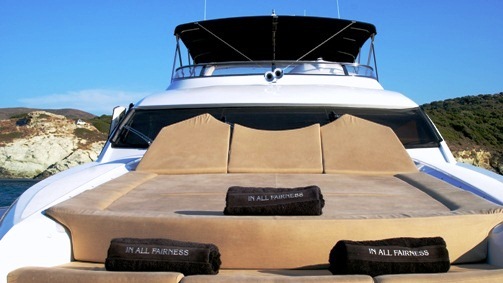 IN ALL FAIRNESS was launched by well renowned Sunseeker in 2007 accommodating 8 guests in 4 well-appointed cabins. 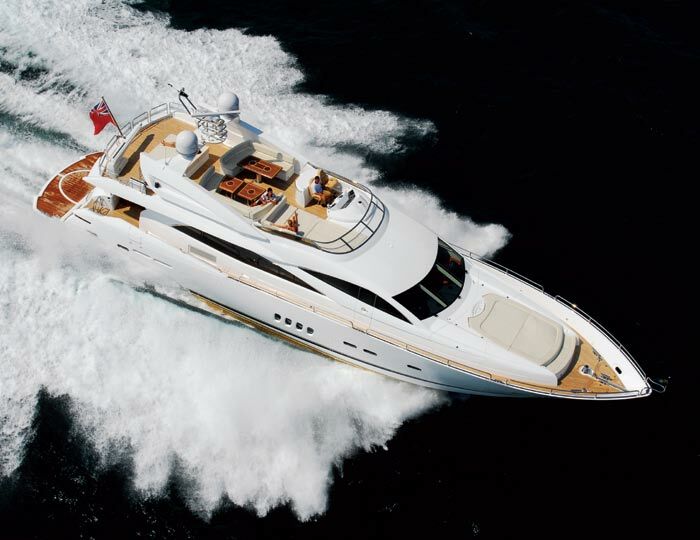 She measures 28 meters (91,9ft) and is powered by Twin Caterpillar C32 ACERT 1800hp engines capable of reaching 20 knots comfortably. 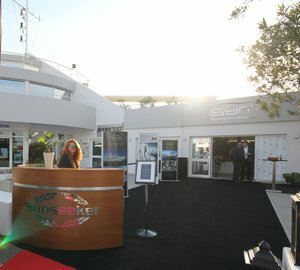 IN ALL FAIRNESS combines indoor and outdoor living seamlessly, her salon is spacious in an open plan boasting a subtle neutral interior with deluxe soft white furnishings, high quality dark wood floors and lovely warm toned wood panels. 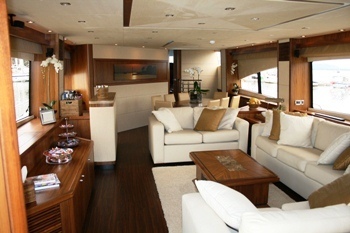 The formal dining space is forward of the salon seating 8 guests easily, large windows allow ample light into the entire area. 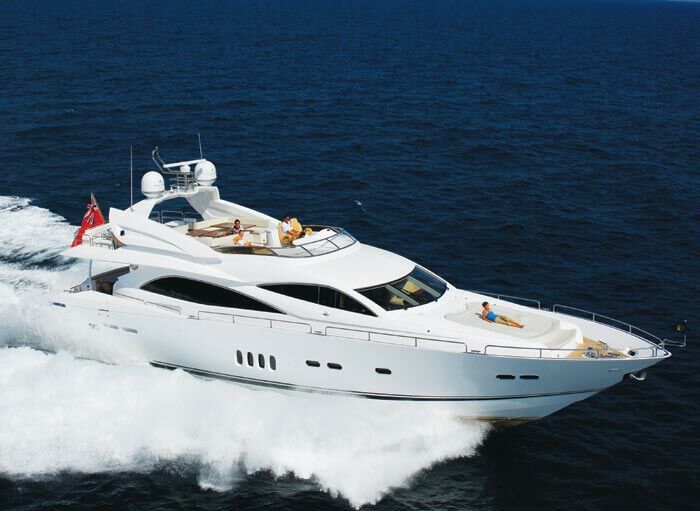 The salon leads out through sliding glass doors onto a relaxing shaded aft deck with plenty of seating and easy access to the swim platform. 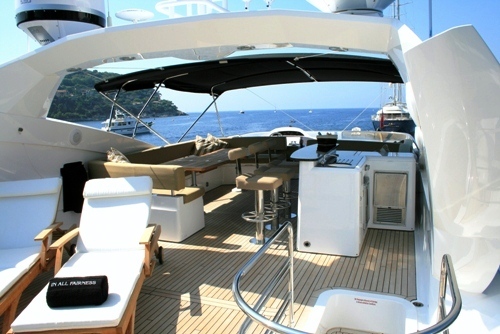 Forward on the main deck massive sunpads are available for guests to enjoy. 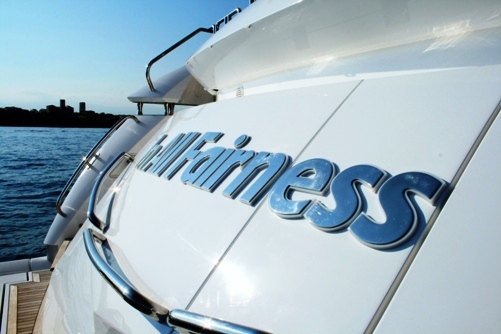 The flybridge on IN ALL FAIRNESS is the perfect space for entertaining with an alfresco dining option, full wet bar, chaise lounges, additional seating and an option Bimini cover. 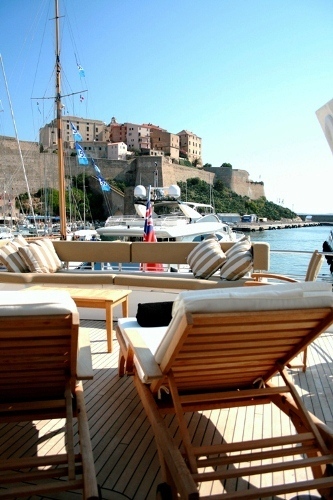 Luxury yacht IN ALL FAIRNESS can accommodate up to 8 guests in 4 cabins. 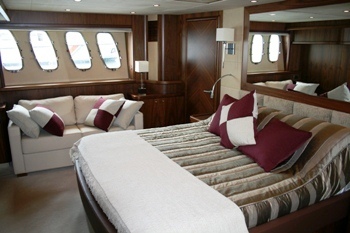 The master suite is full beam of the yacht with a king size bed, love seat and en-suite facilities. 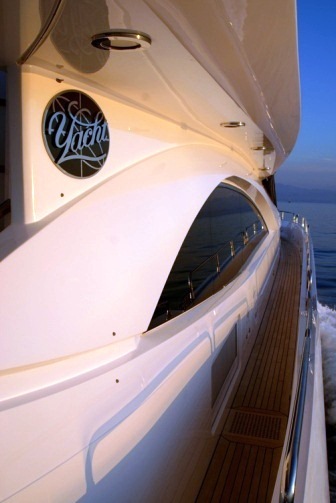 A VIP cabin is forward with a queen size bed and en-suite facilities. 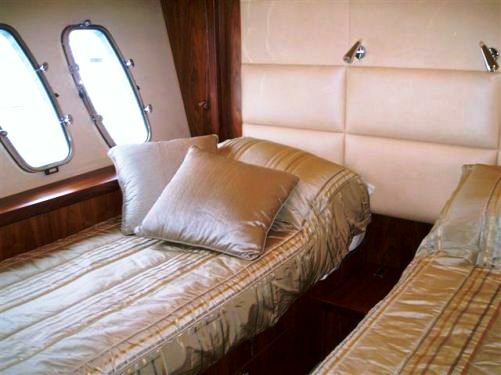 A further 2 double cabins are port and starboard with one able to convert into 2 single beds. 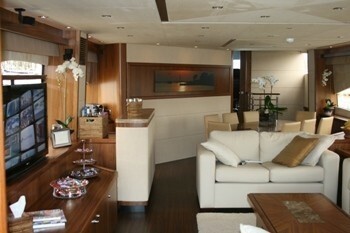 All cabins receive ample natural light and feature a minimalistic tasteful décor. 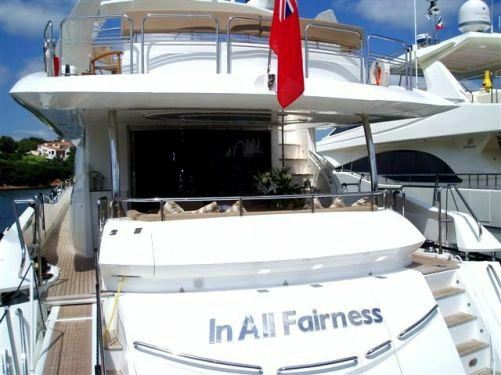 IN ALL FAIRNESS has a great range of extra onboard toys for charter guests to enjoy including the following Tenders & Toys: A Williams Jet Tender 3,85, Donut, Waterskis, Wakeboard, Kneeboard, Two-seater jet ski. 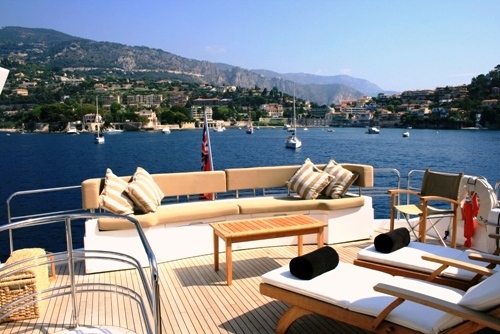 Communications include GSM Wifi, Audio Visual Equipment and Deck Facilities include a 42” LCD TV in saloon, Satellite TV, Bose surround sound system, iPod docking station in saloon, 42” LCD TVs in master & VIP, LCD TVs in guest cabins iPod docking in 3 cabins.